The future pope Pius II was astonished to discover how militarised a society urban Germany was. As he observed in 1444, ‘not only every noble, but even every burgher in the guilds has an armoury in his house so as to appear equipped at every alarm. The skill of the citizens in the use of weapons is extraordinary’. Molinet was equally struck by the military skill of the citizens of one of the smaller towns of the Empire, Neuss, which nonetheless defeated Charles the Bold’s siege in 1475. Even in peacetime military expenditure accounted for 82 percent of Cologne’s civic spending in 1379, and between 76 and 80 percent of Rostock’s in 1437. Such figures ought to give the urban historian pause for thought. However since 1945 German historians have tended to shy away from military history. The military dimension of the urban societies of late medieval Germany cannot safely be ignored by students of their internal divisions, politics and society. War and preparation for war permeated much of civic life. Military self-sufficiency was pursued with vigour. Each town housed a huge quantity of equipment, which in its turn required specialists to maintain and repair it. Johannes Cochlaeus paused in his description of Germany of 1512 to wonder at Nuremberg’s many towers, each a miniature arsenal. To meet their own needs the towns employed fletchers, smiths, stable-hands, crossbow-makers and even cannon-founders. Nuremberg supplied its own needs as well as those of Europe with a highly developed armaments industry. Regulations laid down each citizen’s equipment in a descending scale according to wealth. Only a small number could afford to equip themselves entirely. Forty-six percent of the population of late medieval Frankfurt owned property worth twenty florins or less. To cater for the poor state armouries often in purpose-built buildings stored equipment of all kinds. The wealthy were required to possess armour and often horses. Inspections were carried out annually in Ulm and Strassburg. Care was taken that each citizen swear the arms he presented the inspectors were his and not just borrowed to pass muster. It was not unknown for cities to insist that citizen’s armour never be sold to a foreigner, or passed to any individual such as a Jew or a woman who would not be available for military service. In the later Middle Ages the towns could no longer mark time, content to keep their high-medieval walls and equipment in good condition. Rapid changes in military technology made major alterations essential to security. Especially significant were the problems posed by the development of artillery. Existing town walls had been built as high as possible. That had been rational in the earlier period when, if a besieger risked an assault at all, he generally attempted to scale the walls or to seize a gateway; the higher the walls, the harder to scale. If they were high enough they also offered some obstacle to the flight of incendiary arrows, a frequently used expedient to smoke a defender out. Wooden galleries projected from the top of the walls. The floors of the galleries were holed to enable the defender to harry enemy mining parties working otherwise secure from view in the dead ground at the foot of the walls. Barbicans or massive outworks protected the critical ground before the gates, while frequent towers further enhanced the defender’s ability to sweep every yard of the ground before the walls with arrows. All this was obsolete in the new age of artillery. Walls which had sufficed to deter attackers armed only with mangonels and trebuchets proved increasing inadequate. In the early fourteenth century artillery was not yet powerful; bombards could take only modest charges of powder for fear of the piece exploding. The stone shot used frequently shattered on impact. Iron projectiles and cannon cast in a single piece, able to take much greater charges of powder without bursting, greatly increased the penetrative power of artillery in the fifteenth century. In 1450 Charles VII of France captured sixty towns in a year assisted by the fear the new developments inspired. A breach one hundred and twenty feet wide could be made in under twenty-four hours with a good artillery train. The towns’ ageing walls were unequal to the challenge. Frankfurt’s defences were but one-and-a-half metres thick. Wesel’s were thinner. Robert de la Marche considered six metres to be an appropriate thickness for his chateau of Hasbain. Others built even thicker walls when they could. The height of the old town walls presented a further problem. Now they had to be low to enable cannon mounted on them to sweep the dead ground before the fortification. Cannon were as important a part of the defender’s armoury as the besieger’s. Loaded with small pieces of metal, nails and the like, they could cause great slaughter if well positioned in defence of a city. The Spanish military engineer Pedro Navarro observed in the early sixteenth century: ‘A city can expect to have more guns than an army can carry with it; whenever you can present more guns to the enemy than he can range against you, it is impossible for him to defeat you’. The towns were quicker to acquire artillery than to make major changes to their fortifications. Even small towns possessed large numbers of cannon by the early fifteenth century and the means to manufacture more. Cannon were expensive. One piece purchased by Frankfurt in 1394 cost the city council 1,076 gulden, or the equivalent of well over four hundred head of cattle. Yet cost did not prevent Rostock from successfully replacing its torsion artillery with the new gunpowder devices by 1380. As small a town as Duisburg was willing to meet the costs involved in mounting several cannon at each of its gates, rather than be left behind in the technological race. It was otherwise with the fortifications themselves. The rebuilding of a small stretch of city wall could consume hundreds of thousands of bricks from half a dozen purpose-built ovens. The costs were such that smaller communities like Jauer preferred to make constant small-scale repairs rather than face the tremendous cost of a full-scale overhaul at longer intervals. As late as 1598 Recklingshausen, a town of moderate rank, was still using its old walls unchanged. Hamlyn’s defences were only modified to incorporate bastions and other sophistications after the Thirty Years’ War had passed. Rather than rebuild anew several towns preferred to resort to cheaper expedients. Attempts were made to thicken the walls by piling earth behind them. This promised greater resistance to the new cannon as well as providing more space to deploy defensive cannon. However the massed earth exerted pressure on the masonry before it, and as Duke Philip of Cleves observed at the end of the fifteenth century: ‘whenever the guns batter the wall, the earth tumbles down with the masonry, which makes it all the easier for the enemy to climb into the breach’. Despite the hazards of using earth, councillors at Munster adopted it when they restructured the city’s defences in 1447. Seeking to cut down the height of the walls to reduce their silhouette for hostile artillery they made extensive use of low earthen outworks, broad enough to mount artillery, and, as they hoped, the better able to resist iron shot. The cost of major changes made even the more enterprising towns pause before implementing them. Augsburg hesitated nineteen years before putting its advisers’ plans into action in 1538. Wesel showed equal hesitation, making alterations in 1499 and again in 1526. Only in 1544 did the council demolish the old city walls and rebuild. Such hesitation was not surprising. Even allowing for the size of the peacetime budgets of the Imperial Cities, expenditure on this scale was ruinous. Expenditure on building work, great as it was, was at least subject to some degree of control. Expeditions and actual war could drag a city willingly or unwillingly into acute financial difficulties. Political instability and inner tension followed as the regime struggled with the debt created. In the later Middle Ages the reluctance of the citizens to serve in person added to the financial hazards of war, as cities were now driven to compete for the services of mercenaries to take their place. Mainz’s fifteenth-century debt crisis and the inner turmoil it provoked was closely connected with military expenditure. Cologne was brought to the very edge of bankruptcy by the Neuss war and proved unable to satisfy its anxious creditors with the repayment of their bonds. Yet it had only dispatched a few thousand men to resist Charles the Bold, contributed in stages during the almost year long siege. The cost of mercenaries was so exorbitant that even large towns found it inadvisable to employ more than thirty, or at most a hundred in peacetime. Wages for even short periods were high. The pay of twenty-eight foot soldiers, required to police Nuremberg for twenty-two nights of Frederick III’s stay in the city in Spring 1442 came to a substantial 215 pounds heller. Actual campaigns involved far greater cost. Nuremberg spent 3,807 pounds heller and 3,224 pounds to send contingents to join the crusading hosts of 1421 and 1427 against the Hussites. For various reasons citizens preferred to pay a fine and let the city hire men to take their place on expeditions. Physical discomfort, business inconvenience and the possibility of damage, ransom and death all played their part. A city that forced citizens to depart on expeditions faced widespread desertion in the fifteenth century if it was not careful. Danzig’s officials were hard pressed to prevent the city’s reluctant citizen soldiers in 1414 and 1454 from deserting for all their musters and lists. It became necessary to threaten offenders with deprivation of citizenship and worse. Many towns were forced to roll back the traditional personal obligations of the citizenry in favour of fines and taxes to engage mercenaries in need. Even the Swiss Cantons were not immune to this pressure. In 1442 Zurich was prepared to accept mercenaries from the Empire and further afield rather than press her citizens to serve.North German towns, which in the mid fourteenth century had been able to rely on their own citizens to take to the field, were finding by the fifteenth that it was necessary to hire mercenaries instead. With the cost of mercenaries came the difficulty of procurement and the inconvenience. Sometimes there was an easy way out. The problem of sending troops to join Imperial expeditions when the citizenry were unwilling to go in person could be met by compounding instead. In this way Frankfurt freed itself of its oligation to assist against the Hungarians in 1486 by paying 5,000 florins. It was also possible to make financial arrangements with local nobles, rather than attempt to hire trained mercenaries in a competitive market. Most members of the Swabian nobility had incomes of less than 200 gulden. The marriage of an Augsburg merchant, who although wealthy was certainly not one of the richest in the city, cost 991 gulden in 1518. Even as modest a town as Nordhausen could use its wealth to assure the services of local nobles when in need. Ernst von Honstein and Johann von Peyn were among the many, including Duke William of Saxony, whose commitment Nordhausen was able to buy. However, such agreements were not usually enough. Nuremberg chose to recruit Swiss in 1449 when it needed men to face Margrave Albert. The council was then obliged to write to several Swiss towns to enable an agent to recruit on its behalf. He was instructed to return with at least six hundred whatever the circumstances. Many individuals sought an easy profit by acting as middle men, able to meet the towns’ needs by sub-contracting. The exorbitant sums demanded by one such, William Herter, the victor of Morat, proved too much for the council of Cologne in 1474. After attempting to revive negotiations by offering to take him and his Swiss at lower terms, they eventually despaired and let him seek other employment. Even so their eventual deal with other mercenaries almost plunged the city into bankruptcy, so extravagant was the expense. Each Imperial city had to make its own arrangements for security, its own contracts and alliances and its own foreign policy. The idea of an Imperial police force to impose order centrally, although it excited the theorists, was not a practical proposition in late medieval Germany. At times interested parties might band together to suppress a common enemy. But impartial justice was scarcely to be had. There was little hope for those who could not help themselves, and lacked strong allies. As a local chronicler lamented, recounting the piracy of Eberhard, lord of Epstein, on the route from Mainz to Frankfurt in 1373: ‘Yet there was no one who stood up to him or the other robbers, for there was neither king nor emperor who would stand against their abuses or forbid them’. Defence was a live issue for the towns of the late medieval Empire. Alliances provided only a partial solution. In the last analysis a city had to be able to defend itself. For brief periods the most unlikely allies might find common cause, as in 1432, when Frankfurt and the Archbishop of Mainz combined with others to suppress the notorious Hattstein fortress. But this was rare. The Wendic towns of the Hanse contrived to avoid engagements to each other for the 1460s and most of the 1470s. It required a major external threat before their policy changed. Frankfurt avoided reciprocal defensive commitments with major towns, preferring to ally with local towns of the Wetterau, who for all their small stature at least shared much the same geographical enemies. Thrown back on themselves and their immediate neighbours for their own defence in a hostile environment, it is not surprising that a militaristic atmosphere developed in the towns. Yet it would be wrong to think that they saw their defensive problems as a purely external matter. Internal factions and rivalries complicated the picture. The combination of external enemies and internal dissent was a recipe for disaster in the event of war, laying the city open to a surprise attack, treacherously aided from within, and likely destruction. In Mainz this happened in 1462. Conspirators assisted the Archbishop, Adolf of Nassau, to enter the city. In the ten hours of confused street-fighting which followed fifty citizens died defending the city’s freedom. They failed. Their property, some of it gutted by the fighting, was left for Adolf to dispose of as he pleased. In a single night a city could lose its independence never to regain it. Fear of a similar fate produced extraordinary anxieties. Distrust and paranoia could be aroused for the least reason. All were suspected, even mercenaries in the cities’ pay. They were universally expected to swear detailed oaths of loyalty to their employers. Even so they were not trusted to lock the heavy doors of the gatehouses, which selected citizens were expected to do. Guests and strangers were subject to restrictions in the interests of security. In Mainz landlords were expected under an ordinance of 1494 to keep their guests under surveillance. When a city hosted an event, such as a diet, or coronation, the influx of strangers aroused acute anxiety. However it was impossible to maintain extreme vigilance for protracted periods. The citizens were naturally reluctant to see their lives disrupted too often for the sake of security. Just as they proved reluctant to be drafted on expeditions, they did their utmost to escape the burden of the watch. Even if mercenaries were paid to perform the day-time watch, it was generally accepted that the citizens would have to guard the walls at night. Those who had influence used it to exempt themselves, or to allow substitutes to suffer in their place. The trend alarmed councillors, who at Gottingen tried to prop up the citizens’ falling contribution to security by imposing sentences in the form of additional night watches. Those who could not escape the watch did what they could to mitigate its rigours. Many preferred to dice or gamble the watch through in the conviviality and warmth of one of the watch rooms. Hostility to the watch was such as to make the institution of sergeants necessary to enforce it in Cologne in 1452. Obviously in a state of emergency greater zeal could be expected. During the hostilities of 1449-50 Nuremberg was able to exploit the enthusiasm of the citizenry to deploy large numbers of men. One hundred and eight manned the outer works alone, while many more garrisoned the city’s towers and gates. Cologne was so shaken at the fate of Mainz, stripped of its liberties in 1462, that it completely reorganised its watch. In 1462 and again in 1467 anxious councillors rushed through changes in what had hitherto been a relatively lax system. It was necessary to appeal to the social instincts and even the vanity of the citizenry as well as their fears for security, if their interest was to be engaged for any period of time. Archery societies were subsidised by many councils in the Empire which mixed dining and social events with religion and shooting practice. Tournaments offered the leading urban families an opportunity to reinforce their claims to social standing, which they eagerly seized. Few could afford to maintain a war-horse in the late medieval Empire, and those who could were anxious to let the fact be known. The tournaments hosted by the patrician families of Nuremberg were preserved for posterity in the brushwork of Master Kern in a place of honour on the ceiling of the townhall. It was a matter of pride to compete in such matters with the rural nobility. They for their part regarded such pretences to equality with contempt. When the rural nobility held a tournament at Heidelberg in 1481 it was careful to exclude the town patriciate from the function. In retaliation the towns could hold their own events. Even tiny Recklingshausen maintained its own turniseyacker to pander to the knightly illusions of its upper strata. The patriciate had other reasons to maintain a high military profile; to defend themselves against the challenge of the guilds by diplomacy and the show of force. The stakes were high. After the Nuremberg revolt of 1349 was crushed, the victors executed twenty-three guild-masters and cast another hundred into exile. At Magdeburg in 1304 the authorities burnt ten insurrectionary aldermen of the guilds. Rather than risk a seizure of power by the guilds the patriciate of the North German towns formed associations to deploy their mounted strength. In 1435 the Lubeck patrician society, the Lilienvente, fielded 402 horses to protect its members’ interests. Aachen and Brunswick hosted similar associations, which fulfilled the dual purpose of promoting the existing order in peacetime and reinforcing the array in time of war. Another manifestation of patrician anxiety was the construction of elaborately militarised town houses by some of the burghers of late medieval Germany. In 1364 Siefried von Paradis was attacked by an angry mob. He escaped with his life and the ringleaders were punished, but in 1366 he began the construction of a fortified house. This extraordinary building was designed to be completely secure even if a crowd had taken possession of the ground floor. Holes in the ceiling allowed boiling fuel to be poured on the mob, while the second floor was fortified to resist their advance. In Cologne’s Glockengasse one patrician family built a twenty-three metre high ritterturm, to serve as a refuge and an observation post in time of trouble. The prestige value of these edifices was obvious. Bruges, Ghent, Ypres and the Italian towns found uses for them no less than the troubled burghers of late medieval Germany. Even the street pattern could have social and military implications. An Italian traveller at the end of the fifteenth century noted that in Ulm the streets were ‘wide, straight and paved with cobble stones according to the German custom’. In other words they were suited for the patriciate to use its horses to overawe guild resistance and justify the wealth invested in them. They also allowed the same beasts to be deployed in defence of the city’s liberties should an enemy force entry. Military and political uses merged as one. However this was not always so. On occasion it was necessary to choose between internal stability and external security. Both guild and patrician regimes faced this dilemma, but with subtle variations. The patriciate confronted with political opposition within had to strike a balance in handling the dissenters. If they were disarmed, the city would lose vital men in an external crisis. Left armed they posed an internal security risk. Patrician-dominated regimes at Cologne and Breslau in the fourteenth century had no hesitation in taking the former course and stripping the defence of useful hands. The guilds faced a more acute problem in the cities they had won over. The natural organization of the human resources of a town was geographical. In an emergency each street or local district could be mustered at a nearby point and then directed to the point of need. The patriciate found it both politically and militarily convenient to entrust each district to a man of stature living in it, and each street to a wealthy local figure. In this way the councillors could continue to exert influence through their chosen candidates in an emergency, without the risk that politically suspect individuals would be able to use military power against them. It was quite otherwise for the guilds. Their members could only wield power if concentrated, which required them to form as bodies in an emergency, rather than disperse their strength. throughout the districts where they lived. It was only natural that new and insecure guild regimes sought to change the traditional geographical organization of the city in an emergency to a guild based one. The non-guild population could then gather by confederation of nobles (konstoffeln), or by association of craftsmen (innungen), should the alarm be sounded. However for all its political advantages this new disposition compromised the city’s external security. In the past a citizen had only to step a few yards outside the door of his house to join his street or district captain in an alarm. Now he could face a protracted journey through streets packed with jostling frightened townsmen before reaching the assembly point for his guild or association, which might well be on the opposite side of the town. The resulting confusiong prejudiced the ability of a surprised town to organize and defend itself in the precious minutes after the alarm was raised. It was not surprising therefore that Basle and Strassburg abandoned their guild-based alarm arrangements as soon as they judged it safe to do so. There could be no question of this in the atmosphere of the early days of their rule, when the guild leaders in Strassburg took to patrolling the streets with a posse in the evenings out of fear of a patrician counter-coup. However not all guild regimes chose to go as far as Strassburg and Basle in experimenting with politically-inspired forms of military organisation. Nordhausen kept the outline of the old patrician geographically-based system after its rising of 1375, but allowed some confederations or craftsmen to appear as separate entitites within it. In Cologne in 1396 no change was made at all. Internal instability, growing disenchantment with personal military service, and the widening gap between the power of artillery and the ageing defences of most towns of late medieval Europe ought perhaps to have drained their martial enthusiasm. The cost of mercenaries and the threat of bankruptcy were compelling arguments for the avoidance of war. Yet in 1484 Rostock was prepared to go to war because its council had taken offence at the erection of a collegiate church with which the dukes of Mecklenburg intended to burden them. Admittedly they could be persuaded to pull back from their bellicose posturing by their partners in the Hanseatic League. But there is no indication that the town feared for its safety in such a confrontation. Whatever the towns’ problems, opponents were likely to encounter greater difficulties. Princes were not usually in a position to exploit urban weakness. The bulk of their assets were frozen in landed estates, so that the towns’ greater liquidity put them at a major disadvantage. The princes also found it difficult to acquire an adequate artillery train. 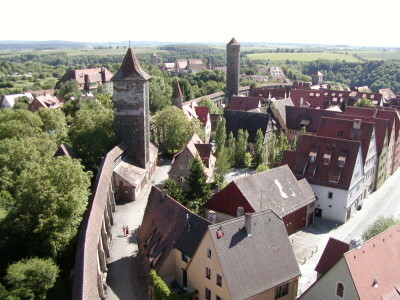 The Duke of Wirtenberg was even reduced to borrowing a large cannon from Schwabisch Hall for a feud in 1504. Often the prince’s sole hope lay in surprising the city. If the watch was slack, the town became at risk to even an inferior opponent. In 1462 Mainz lost its liberty in a surprise assault by the Prince-Archbishop. In 1371 Luneburg almost shared its fate, when the city’s watch failed to detect the approach of Duke Magnus Torquatus. Three councillors, two burgomasters and many others died before the Duke could be forced to retreat after a savage street battle. Once the initial moment of surprise had passed, the attacker was likely to be at a disadvantage, when he settled down to a protracted siege. Neuss was invested by Charles the Bold before the harvest of 1474 could be gathered in. Yet despite this handicap the city’s reserve stocks were quite adequate to sustain resistance throughout a three hundred and seventeen day siege. In fact it was often the besieger who had more to fear from inadequate supply. The supply required by a large besieging army was not lightly managed. In the course of the Sost feud of 1444-9 the Archbishop of Cologne, Dietrich of Mors was twice driven by lack of provisions to abandon a siege. Incompetence could be generally relied on to blight a besieger’s prospects. Charles the Bold failed to enforce a watertight cordon around Neuss and paid the price for his carelessness. The reinforcements which reached the town through the gaps in his lines probably made the difference between the success and failure of his enterprise. A town had little to fear from an average opponent. Even the Swiss could be caught out on occasion, as in 1441 when they had to send home for artillery. Though the technical and social changes of the later Middle Ages had greatly eroded the towns’ ability to defend themselves, the erosion was not fatal to their position in the Empire. Their rivals suffered no less than they from a need to modernise in order to press their advantage. Their failure to capitalize on the towns’ weakness in this period is striking. Surprising as it may seem many more urban regimes succumbed in these difficult years from internal pressures than to the superior force of their enemies abroad. 1. M. Jahns, Handbuch einer Geschichte des Kriegswesens (Leipzig, 1880), ii. 965. N. Bommels, `Die Neusser unter dem Druck der Belagerung’, Neuss, Burgund and das Reich (Neuss, 1975), p. 258. 2. W. Freynhagen, Die Wehrmachtsverhaltnisse der Stadt Rostock im Mittelalter (Schwerin i. M., 1930), p. 30. 3. For some comments on this matter, see V. Schmidtchen, Bombarden, Befestigungen, Buchsenmeister (Dusseldorf, 1977), p. 8. 4. Johannes Cochlaeus, Brevis Germaniae Descriptio, 1512, ed. K. Langosch (Darmstadt, 1969), p. 78. 5. E. Ennen, Die Europaische Stadt des Mittelalters (Gottingen, 1972), p. 192. 6. H. Jecht, `Studien zur gesellschaftlichen Struktur der mittelalterlichen Staedte’, Vierteljahrschrift fur Sozial- und Wirtschaftsgeschichte, xix (1926), 72. K. Saur, Die Wehrverfassung in schwdbischen Stddten des Mittelalters, (Freiburg i. Br., dissertation 1911), p. 11. 7. E. Kober, Die Wehrverfassungen Braunschweigs and seiner Nachbarstddte (Marburg, dissertation 1909), p. 59. 8. Freynhagen, Wehrmachtsverhaltnisse, p. 89. 9. K. Jacobs, Das Aufkommen der Feuerwaffen am Niederrhein bis zum Jahre 1400 (Bonn, 1910), pp. 13 and 69. Jahns, Geschichte, ii. 1154. 10. M. Romeiss, `Die Wehrverfassung der Reichsstadt Frankfurt a. M. im Mittelalter’, Archiv fur Frankfurts Geschichte und Kunst, x1i (1953), 11. 11. J.R. Hale, `The Early Development of the Bastion: An Italian Chronology c.1450-c.1534′, Europe in the late Middle Ages, ed. J. R. Hale et al., (London, 1965), p. 477. 12. S. Fiedler, Kriegswesen and Kriegfuhrung im Zeitalter der Landsknechte (Coblenz, 1985), p. 129. 13. Freynhagen, Wehrmachtsverhkltnisse, p. 90; M. Perry, `Die niederrheinische Stadt als Festung’, Rheinische Vierteljahrsblatter, xlv (1981), 73. 14. H. Marwede, Die Befestigung der Stadt Geldern 1386-1415, (Wiirzburg, 1934), pp. 56‑7. C. Schonaich, Die alte Jauersche Stadtbefestigung (Jauer, 1903), p. 6. 15. C. Haase, `Die mittelalterliche Stadt als Festung’, Die Stadt des Mittelalters, ed. C. Haase, (Darmstadt, 1978), i. 410, n. 88. 16. C. Duffy, Siege Warfare. The Fortress in the Early Modern World 1494-1660 (London, 1979), p. 2. 17. H. Marre, Die Wehrverfassung der Stadt Munster 1536-1650 (Munster, 1913), p. 68. 18. J. Kraus, Das Militarwesen der Reichsstadt Augsburg 1548-1806 (Augsburg, 1980), pp. 354-5. 19. D. Bellebaum, Die Befestigungen der Stadt Wesel in ihrer Entwicklung (Cologne, 1961), p. iii. 20. H. Schrohe, Das Mainzer Geschlecht zum Jungen in Diensten des deutschen Koningtums and der Stadt Mainz, 1353-1437 (Mainz, 1933), p. 2. 21. M. Gechter, Kirche and Klerus in der Stadtkolnischen Wirtschaft im Spdtmittelalter (Wiesbaden, 1983), p. 38. 22. Die Chroniken der frankischen Stadte (Leipzig, 1864), iii. 392. 23. Ibid, pp. 34 and 47-8. 24. M. Baltzer, Zur Geschichte des Danziger Kriegswesens im 14. and 15. Jahrhundert (Danzig, 1893), p. 11. 25. F_J. Mone, ‘Uber das Kriegswesen im 13-15. Jahrhundert in Rheinpreussen, Elsass, Baden, Bayern, Schweiz’, Zeitschrift fur die Geschichte des Oberrheins, vi (1855), 168. 26. H. Fischer, Die Tednahme der Reichsstddte an der Reichsheerfahrt vom Interregnum bis zum Ausgang Kaiser Karls IV (Leipzig, 1883), p. 25. 27. Romeiss, Frankfurt, p. 46. 28. Two thirds of some 139 members of the Swabian nobility whose finances have been examined, had an income of less than 200 gulden. Only two could muster more than 800 gulden per annum. W. Abel, Agrarkrisen and Agrarkonjunktur (Hamburg, 1978), pp. 83‑4. 29. G. Meissner, Das Kriegswesen der Reichsstadt Nordhausen 1290‑1803 (Berlin, 1939), pp. 69-72. 30. M. Mendheim, Das reichsstddtische besonders Nurnberger Soldnerwesen im 14. and 15. Jahrhundert (Leipzig, 1889), p. 73. 31. F. Redlich, ‘The German Military Enterpriser and his Work Force, a Study in European Economic and Social History’, Vierteljahrschrift fur Sozial- and Wirtschaftsgeschichte, Beiheft xlvii (1964), 18-19. 32. Die Chroniken der mittelrheinischen Stadte, ed. C. Hegel (Leipzig, 1882), ii. 190. 33. Romeiss, Frankfurt, p. 22. 34. H. Sauer, Hansestadte and Landesfuersten. Die wendischen Hansestadte in der Auseinandersetzung mit den Furstenhdusern Oldenburg and Mecklenburg (Vienna, 1971), p. 166. Romeiss, Frankfurt, pp. 39-40. 35. Geschichte der Stadt Mainz, ed. A Bruck and L. Falck (Dilsseldorf, 1972), v. 1; Hegel, Mittelrheinischen Stadte, ii. 3. 36. Bruck, Geschichte, pp. 10-11. 37. Saur, Wehrverfassung, p. 10, no. 6. Romeiss, Frankfurt, p. 35. 38. Kober, Wehrverfassungen, pp. 32 and 30. 39. T. Heinzen, Zunftkampfe, Zunftherrschaft and Wehreverfassung in Koln. Ein Beitrag zum Thema “Ziinfte and Wehrverfassung” (Cologne, 1939), p. 53. 40. P. Sander, Die reichsstadtische Haushaltung Niirnbergs dargestellt auf Grund ihres Zustandes von 1431 bis 1442 (Leipzig, 1902), pp. 177-8. 41. Heinzen, Zunftkampfe, pp. 42-3, 81 and 92-4. 42. T. Reintges, Ursprung und Wesen der spdtmittelalterlichen Schutzengilden (Bonn, 1963). 43. Mendheim, Soldnerwesen, p. 10. 44. Reintges, Schutzengilden, p. 118. 45. M. Clarke, The Medieval City State (London, 1926), pp. 87 and 92. 46 E. von der Nahmer, Die Wehrverfassungen der deutschen Stddte in der zweiten Halfte des 14. Jahrhunderts (Marburg, dissertation 1888), pp. 8-11. 47. A. von Cohausen, Die Befestigungsweisen der Vorzeit and des Mittelalters, auf seinen Wunsch herausgegeben von Max Jahns (Wiesbaden, 1898), pp. 200-2. 48. F.R.H. Du Boulay, Germany in the Later Middle Ages (London, 1983), p. 118, n. 7. 49. Von der Nahmer, Wehrverfassungen, p. 35. 51. Meissner, Nordhausen, p. 39. Heinzen, Zunftkampfe, p. 29, n. 64. 52 Sauer, Hansestadte, p. 160. 53. F.J. Mone, `Uber das Kriegswesen’, Zeitschrift fur die Geschichte des Oberrheins, xvii (1865), 294, n. 5. 54. V.Schmidtchen, `Das Wehr und Wachtwesen niedersachsischer Stadte im Spatmittelalter am Beispiel von Osnabruck and Liineburg’, Stadt im Wandel, ed. C. Meckseper (Stuttgart, 1985), iv. 294. 55. Bommels, Neusser, pp. 268-72. 57. Mone, Kriegswesen, vi. 131. This entry was posted in Articles and tagged 14C, 15C, 16C, artillery, Germany, Late Medieval, Pope Pius II, Strategy, Urban Studies. Bookmark the permalink.